Jun “Hercules” Doliguez of Sarangani Province suffered the first defeat of his young career when he lost to Francisco Piña of Ensenada, Baja California, Mexico via Unanimous Decision in six rounds of rugged action Saturday night in Tijuana, Mexico. Judges at ringside scored it 57-56 and 59-55 twice for Piña who capitalized on a first round knockdown to score the upset win on the previously unbeaten Doliguez. Doliguez was knocked down early in the fight by a very aggressive Piña, who attacked the Filipino like a rabid dog when the first bell was sounded. A big right sent Doliguez to the ropes and another right sent him to the canvass less than a minute in the fight. Doliguez recovered and finished the round and fought actively in the remaining rounds of the fight. He moved and fought from a distance, avoiding Piña’s attempts to muscle him in a corner and the ropes where the Mexican was successful. But the knockdown set the tempo for the fight. Doliguez was getting hit by Piña when he lunges in to attack. 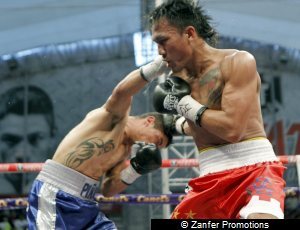 The Mexican also scored with uppercuts and hooks when he was able to force Doliguez to fight in the inside. Doliguez tried to even the knockdown by working Piña’s body in the last two rounds, in an attempt to land a big one to the head. Piña though, was also able to make Doliguez miss with his punches upstairs which also forced the Filipino to be out of balance in the process. Doliguez's record falls to 18 wins (14 KOs) against 1 loss and 2 draws while Piña improved his lot to 6 wins against 6 losses and 2 draws in his thwarting of the Filipino featherweight.